Given the rather unfavourable critical response that it received when it opened at the St. James Theatre back in May (when barbs such as “plodding” and “thinly plotted” were thrown at it), James Phillips’s McQueen may seem a somewhat surprising candidate for a West End transfer. However, it’s worth remembering that John Caird’s production of Phillips’s play - an account of the life of the late, much admired fashion designer Alexander McQueen - was a huge commercial hit at the St. James, where it broke box office records for the theatre. The play’s success was doubtless boosted by interest in "Savage Beauty," the phenomenonally popular exhibition of McQueen’s dresses and designs at the V&A, which ran concurrently with the show, and also by the presence of Glee’s Dianna Agron in the cast. And so Caird’s production (minus Agron) now pitches up at Theatre Royal Haymarket, where it’s booking until November. In preparing the transfer, Phillips has rewritten and extended some scenes, taking the opportunity to “refine” the material. I didn’t see the show at the St. James so can’t comment on how the re-jigged version compares, but it certainly seems that Phillips and his collaborators have worked hard to make the production confident and West End-worthy, and the results surpassed my expectations overall. 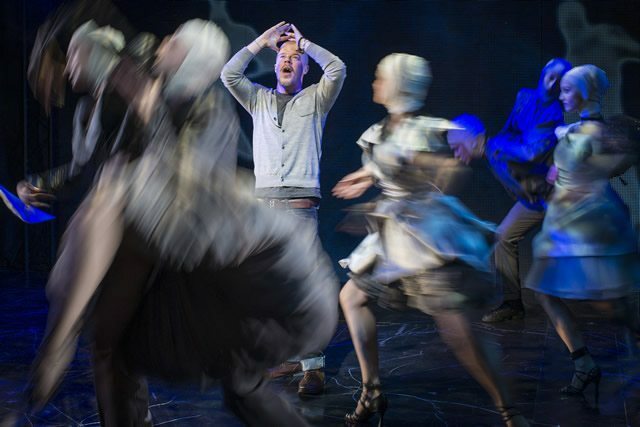 Part dark-night-of-the-soul drama, part whistle-stop-tour through its subject’s life, the play draws one of its central motifs from McQueen’s 2008 collection “The Girl Who Lived in The Tree”. It presents McQueen being confronted by Dahlia, a troubled girl who has been spying on the designer’s Mayfair pad for days. Finally entering the house, intent on stealing a dress, Dahlia finds the isolated and depressed McQueen (mid phone-call to Philip Treacy) hostile yet sufficiently intrigued to engage her in conversation. Whereupon begins a journey that takes the pair through some of the pivotal events and locales in McQueen’s life – from Savile Row tailors Anderson & Sheppard, to druggy parties, to his Mum’s house – as the play broadens into a wider inquiry into creativity versus the death drive, and the difficult challenge of just "surviving the night." Drawing inspiration from McQueen’s controversial, hugely influential shows (“my nightmares, my dreams”, as he defines them here), Caird’s production was viewed by some as an emptily flashy affair when at the St. James: an example of style without substance. This criticism doesn’t seem entirely valid, though. The show is often flashy in its aesthetic, but its flourishes are for the most part expressive and dynamic, with judicious use of screens and some excellent choreography by Christopher Marney achieving nifty movements between scenes and locations. A transition from elegant dancing to full-on techno rave (and back again) is especially exciting. Stephen Wight’s performance as McQueen was widely viewed as the show’s greatest asset at the St. James, and Wight really is superb here, capturing with great feeling the designer’s volatility and vulnerability. He’s especially touching when expressing McQueen’s love for his mother, and when outlining his philosophy of couture as fundamentally transformative: “A dress alters you inside... It's a sidestep into another self.” Replacing Agron, Carly Bawden is also terrific as Dahlia: both eager fan and McQueen’s ever-questioning alter ego, the actress generates a great, prickly/tender dynamic with Wight. Tracy-Ann Oberman’s camp cameo as Isabella Blow, the fashion editor/stylist who was instrumental in McQueen’s success and whose suicide traumatised him, is less effective, and the crafting of this scene feels weak. But overall there’s enough intelligence in Phillips’s writing, and enough strength to the performances, to make McQueen an engaging and surprisingly soulful experience.